We, “Atul Pipe Company”, established in the year 2002, have become leading manufacturer, supplier, trader, exporter and importer of Industrial Flanges, Valves & Fittings. Our wide range includes Steel Flanges, Carbon Steel Flanges and Short Bend Elbow. Our offered range of products are widely used in various industries for their vast features. Our technical know how helps us to innovate and create products meeting industry specific requirements. Our expertise in this field enables us to offer these products on reasonable prices, giving us an edge over competitors. We owe all our success and recognition to the quality standards that we maintain in our organization. We take all measures to constantly improve the quality along with maintaining the consistency. Under the mentorship of "Mr. Sandeep Goyal / Sushil Goyal (Director)", we have created a niche for ourselves in this industry. With their vast industrial experience, we have delivered quality range of products, due to which we have attained a huge clientele. We have our huge clientele from Sri Lanka & Dubai and import from China. Trading, Importer AND Exporter of Industrial Flanges, Valves and Fittings. 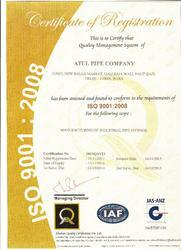 Our company being a quality conscious company follows all measures to offer superior grade fittings. All the raw materials is procured from trusted suppliers and vendor in the form of sheets and blocks. This material is then tested and checked for its quality and durability in our quality control department. Close observation made by quality inspectors and controlled manufacturing, ensures production of perfect fittings at minimum level of wastage. Our persistent efforts have been well appreciated by all our clients. Further, to achieve our goal we train our efficient workforce to understand and meet the various requirements of our customers. We stick to our commitment and favorably serve our customers that help us satisfy our clients. We get repeated orders on the basis of our long term business relations and inturn get a positive feedback from our customers who are delighted by our extraordinary products. We envision combining technology, managerial skills, innovation, experience, judgement and responsibility in order to provide premium quality at competitive price ensuring utmost customer satisfaction. We are backed by a state-of-the-art-infrastructure unit that spread across a vast area. These units help us in maintaining smooth workflow and ensure systematic business operations in an efficient manner. The manufacturing unit is installed with all the latest and advanced equipment and machinery that ensures a hassle free manufacturing process. We are a coveted firm involved in manufacturing and exporting a quality assortment of Industrial Flanges, Valves & Fittings. Customers can avail our range at reasonable prices and deliveries are made in promised time period. Our products are manufactured on the basis of international standards and specifications that allows us to deal with customers both in India and aboard. We are an ever-expanding company that has the capacity and capability to deal with any industry in national and international markets.